WindeeVent is a revolutionary, passive garage ventilation system. The WindeeVent allows circulation of air without having to raise garage doors. The WindeeVent is the only after-market, adjustable vent with a mesh screen that is designed to fit directly into standard garage door profiles. The WindeeVent opens and closes to allow fresh air to enter and exit the garage. Originally designed and patented to let heat escape, we have found that our WindeeVent has many other benefits such as lowering utility costs in hot summer months, reducing carbon monoxide buildup from engines, and increasing the longevity of appliances and tools stored in the garage. Call us today for details. There is a sad and all too familiar issue that every garage using person has faced. Over the past 50 years the garage has transformed into many things other than the simple place to park your car. To the average person the garage has become the storage epicenter for surplus belongings, bicycles, tools, yard equipment, chemicals to clean your house and pool, congregation space commonly known as a man cave, and in some cultures, cooking. The problem that 99% of these garages face is poor-to-no ventilation. The common solution is raise the garage door to let the heat and odors escape. You see it in every neighborhood. Garages with doors cracked all day giving access to bugs, critters and thieves. Consequently, leading to another set of symptoms called “surplus-bugs-among-us” and “please, come-steal-my-stuff”. WindeeVent is the only after-market adjustable vent with a mesh screen that is designed to fit directly into standard garage door profiles. The WindeeVent opens and closes to allow passive air flow into the garage. Originally designed and patented to simply let heat escape, we have found that our WindeeVent has many other benefits such as lowering utility costs in hot summer months, reducing carbon monoxide buildup from engines and increasing longevity of appliances stored in the garage. Reduces Heat in the garage. Attached garages are usually unfinished and share a common interior wall that retains heat. Most of these garages are un-insulated allowing heat to enter the house. Consequently, the heat from the garage makes AC units work continuously to maintain cooler temperatures. WindeeVents create an opening in the garage for heat to escape, therefore minimizing heat entering the house and allowing mechanical units to work efficiently. Reduce Odors and Gases in the garage. The garage has become a catch all for anything we don’t want to store in the house. Annoying odors from vehicles, gas cans, yard and gardening equipment, chemicals to clean the house and pool, trash, and mildew all contribute to a smelly garage. The gases released can increase the rate at which metal components (appliances, tools, bikes, door hardware, etc) rust. 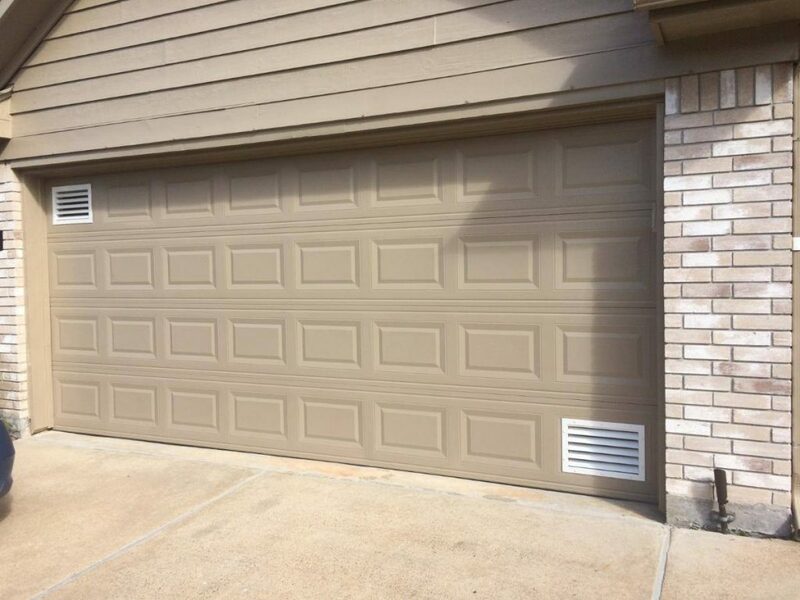 The WindeeVent creates an opening in the garage door to improve air circulation, thereby reducing these odors/gases and increasing the lifespan of many products, including that extra refrigerator you keep in the garage. Improve Indoor Air Quality. Indoor Air Quality has become an increasing concern in last half century. It has become so important that the US Green Building Council has created the Leadership in Energy and Environmental Design (LEED) certification program. LEED is a green building certification program that recognizes best-in-class building strategies and practices. To receive LEED certification, building projects satisfy prerequisites and earn points to achieve different levels of certification. Including WindeeVents in the overall design, may help earn points under Indoor Evironmental Quality, EQ Credit 2: Increased Ventilation. Although, the WindeeVent is in NO way endorsed by the USGBC or the City of Houston, the Green Building Resource Center in the City of Houston Permitting Department has given WindeeVent permission to place a permanent display in the green friendly product display area. Reduces Carbon Monoxide released from vehicles from entering the house. There is a real and deadly issue with Carbon Monoxide buildup in Garages where engines are running. Whether warming up your vehicle before work on a cold day, or forgetting to turn off your quiet push start car, CO buildup in a low ventilated area is deadly. Adjustable settings for inclement weather. Mesh Screen keeps the bugs out. Designed to fit into standard garage door panels. Designed to resist forcible intrusion. Made of High Quality Aluminum with powder coat finish (white & almond). May help achieve LEED Certification. Does not use any electricity. Back Plate Design and extra long carriage bolts allows WindeeVent to be installed in other door styles and directly into metal panels of pre-engineered metal buildings.